BELLWORK Why did Japan leave the League of Nations? Describe how/why the Japanese military expanded in China. How did the U.S. respond? What was the goal. 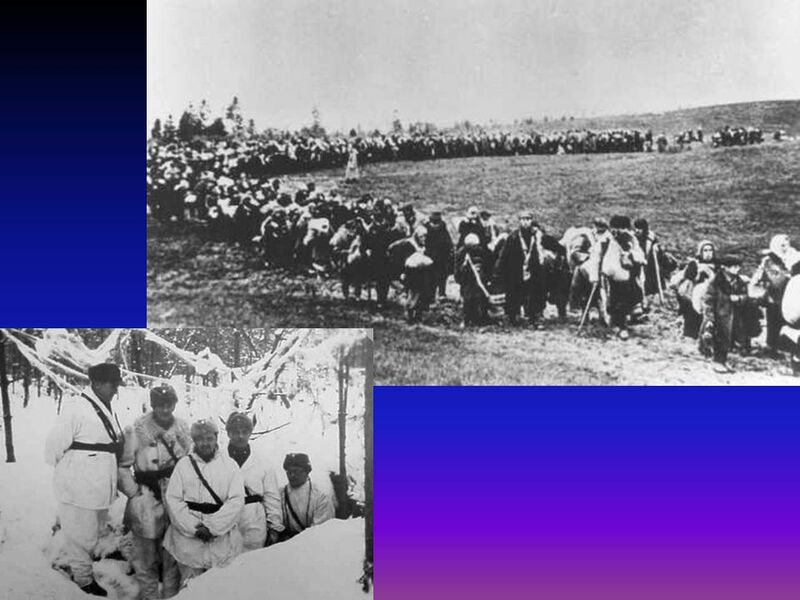 1 BELLWORK Why did Japan leave the League of Nations? Describe how/why the Japanese military expanded in China. How did the U.S. respond? What was the goal of the Greater East Asia Co- Prosperity Sphere? 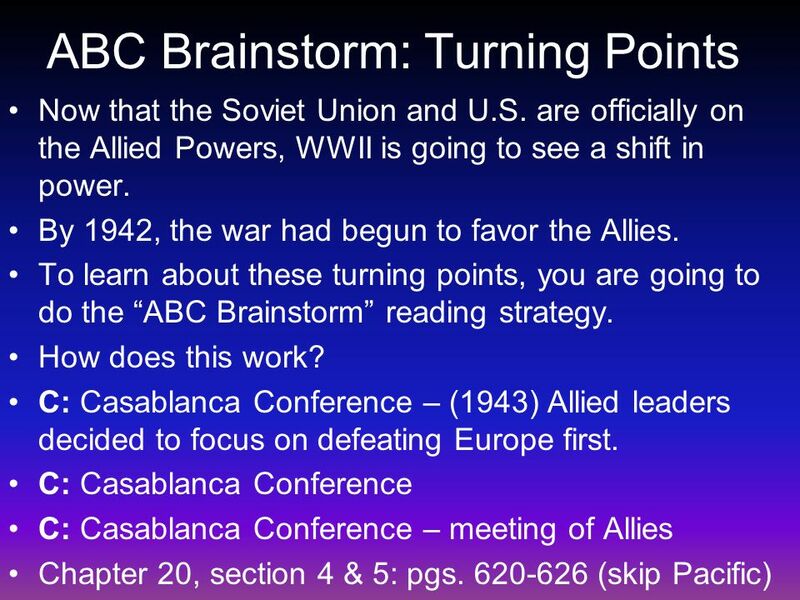 List three similarities between the countries/leaders in the Axis Powers alliance. 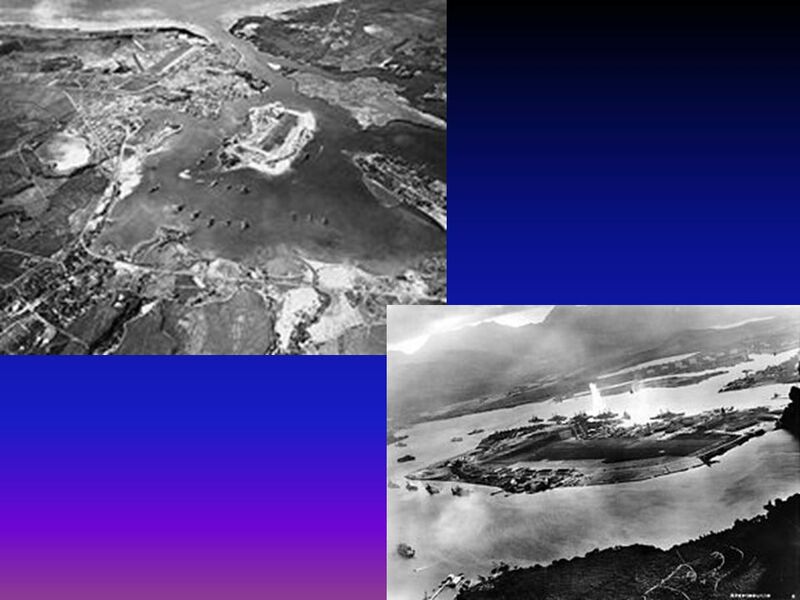 After Japan expanded into French Indochina & the East Indies, how did the U.S. punish them? (list 3!) THINKER: As you know, Hideki Tojo became the leader after the military became more powerful than the government. In your opinion, why didnt the Japanese government & Emperor Hirohito stop him? 3 Battle of Britain After Germanys victories in Eastern Europe & France, there was only one major power left in western Europe to fight. Great Britain. 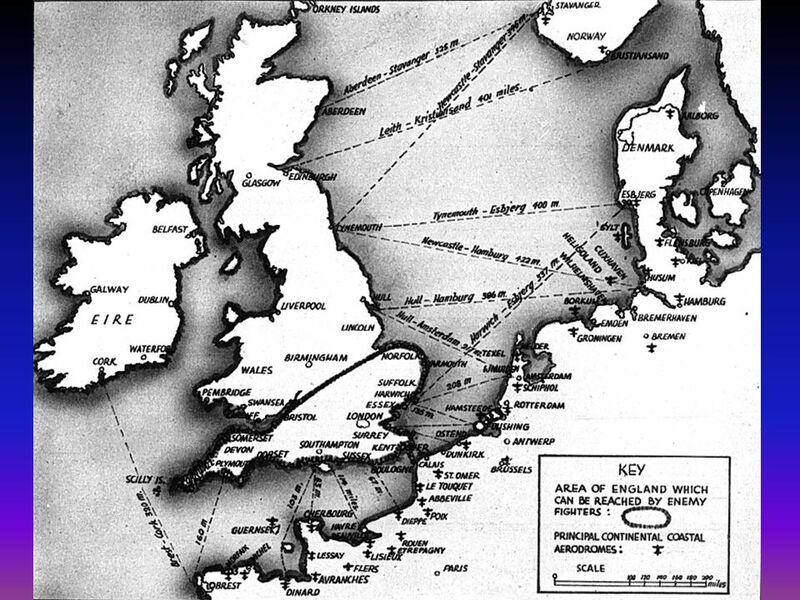 Germany made plans to invade Great Britain. However, Great Britains Royal Air Force engaged German forces in defense of the nation. 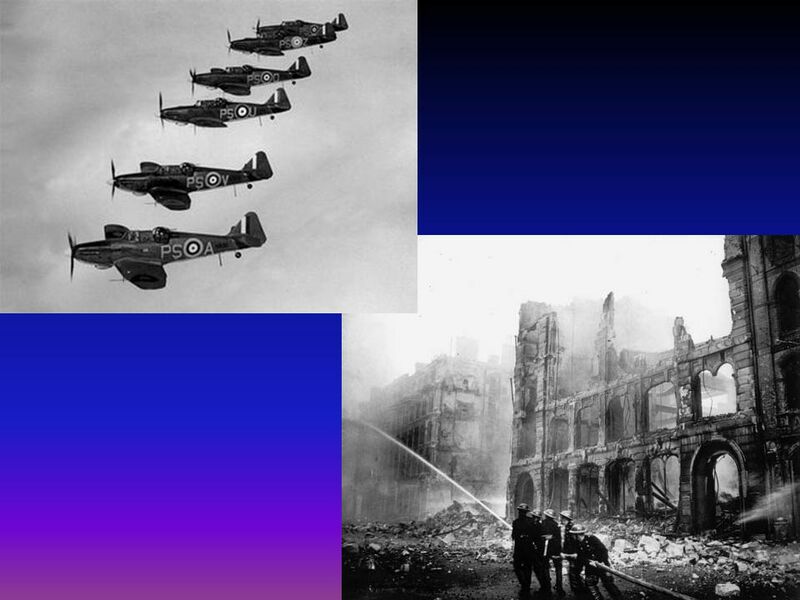 Battle of Britain- largest air assault in history. 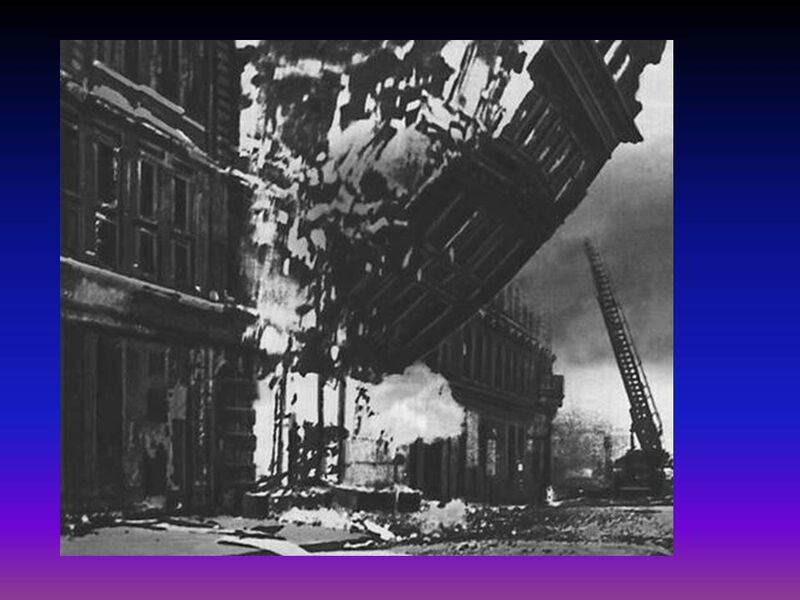 German air force bombed British cities & industrial centers. Yet, could not force a surrender. 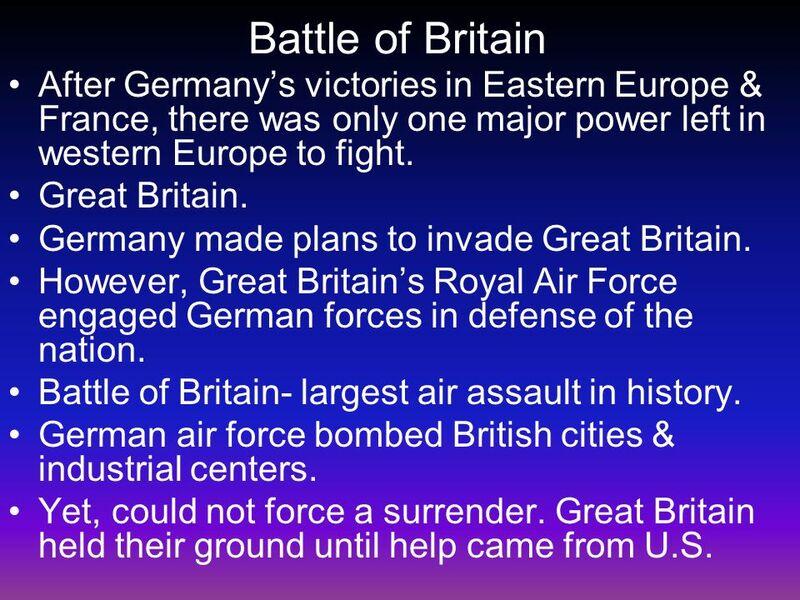 Great Britain held their ground until help came from U.S.
7 Operation Barbarossa In your textbook, read Invasion of the Soviet Union on pgs. 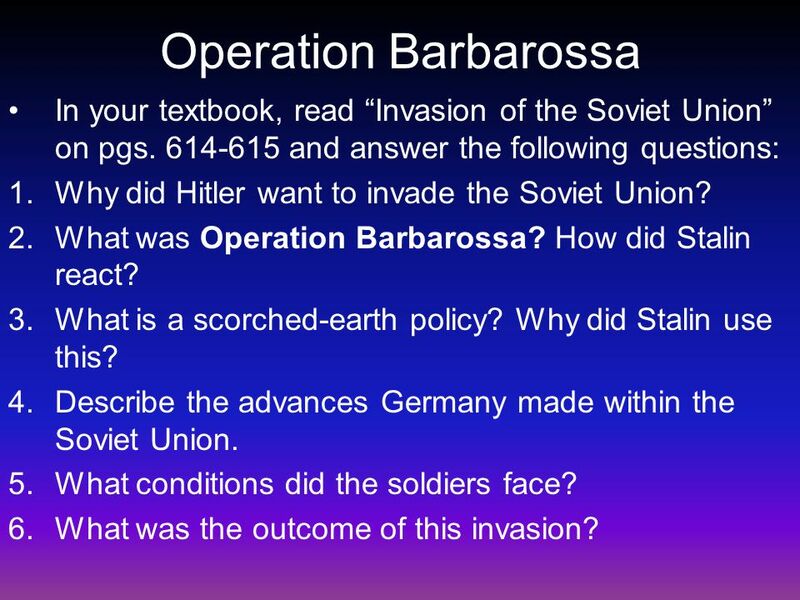 614-615 and answer the following questions: 1.Why did Hitler want to invade the Soviet Union? 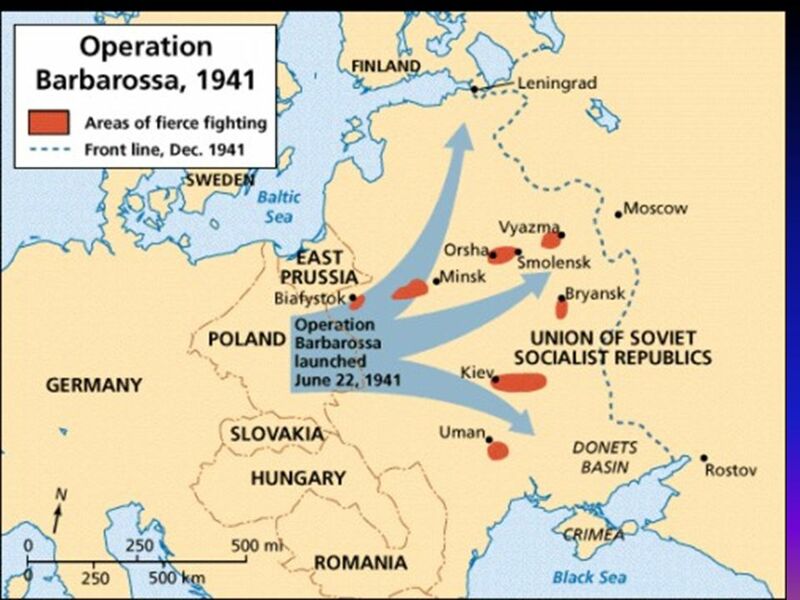 2.What was Operation Barbarossa? How did Stalin react? 3.What is a scorched-earth policy? Why did Stalin use this? 4.Describe the advances Germany made within the Soviet Union. 5.What conditions did the soldiers face? 6.What was the outcome of this invasion? 12 Lend-Lease Act Prime Minister Churchill confessed to FDR that Britain was nearly bankrupt and needed more American equipment. FDR provided war supplies to Britain without any payment in return. 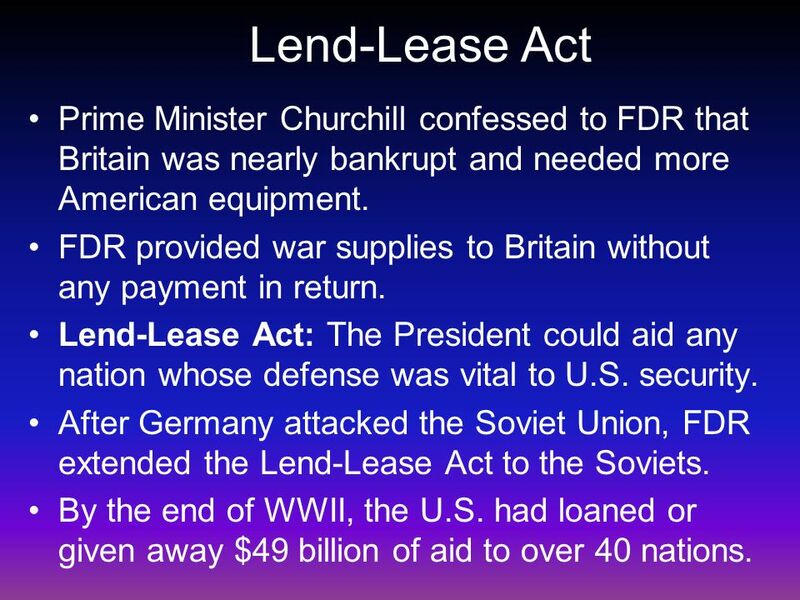 Lend-Lease Act: The President could aid any nation whose defense was vital to U.S. security. 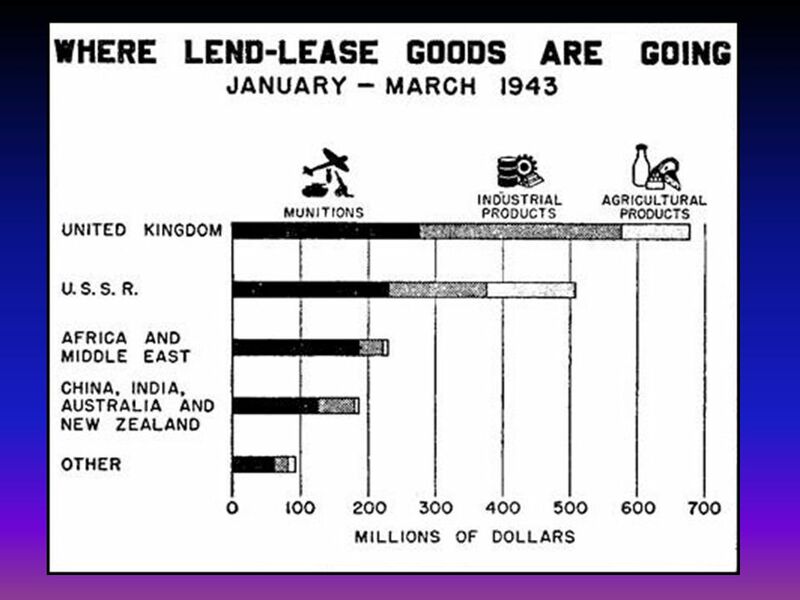 After Germany attacked the Soviet Union, FDR extended the Lend-Lease Act to the Soviets. By the end of WWII, the U.S. had loaned or given away $49 billion of aid to over 40 nations. 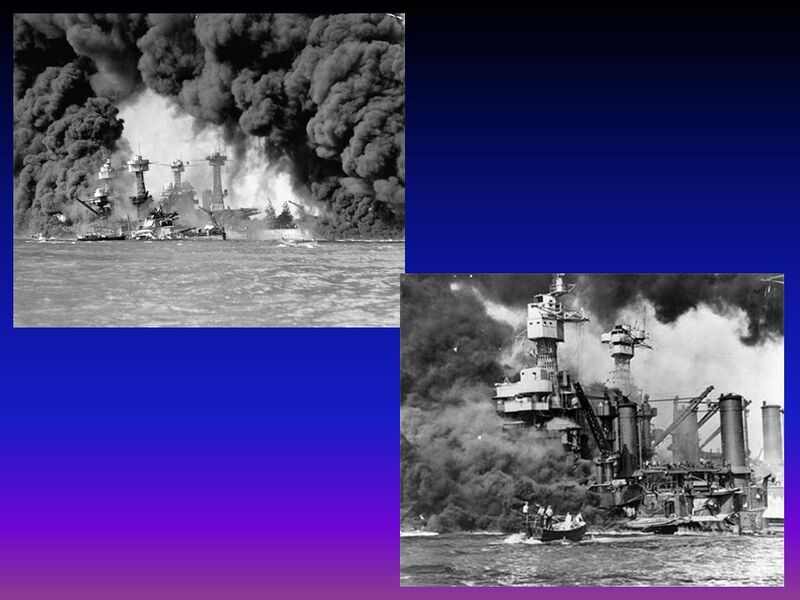 14 Pearl Harbor Tensions continued to grow between the powers, until…… December 7, 1941 Japan attacked Pearl Harbor, a naval base in Hawaii. 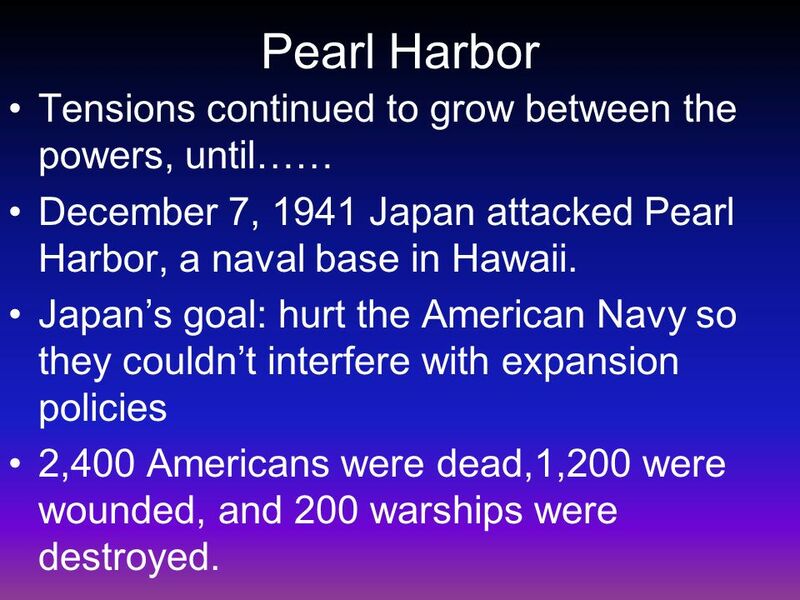 Japans goal: hurt the American Navy so they couldnt interfere with expansion policies 2,400 Americans were dead,1,200 were wounded, and 200 warships were destroyed. 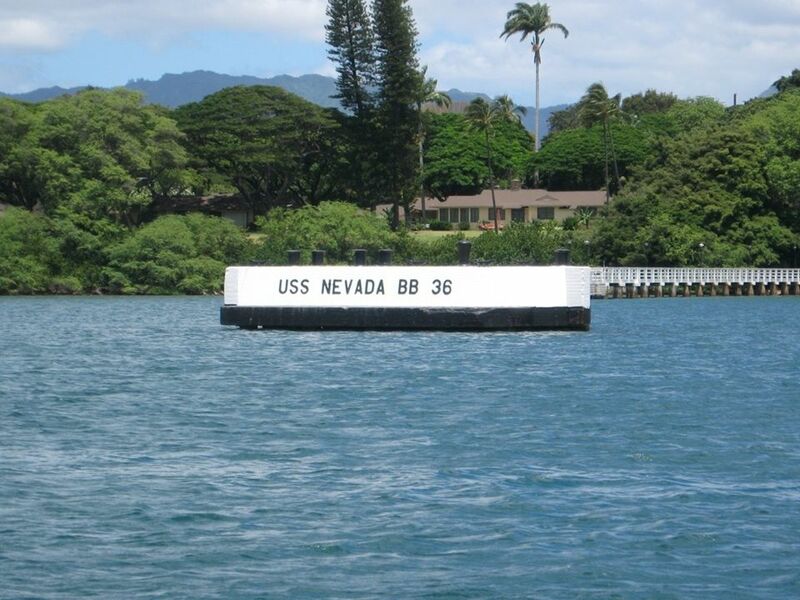 18 U.S.S. 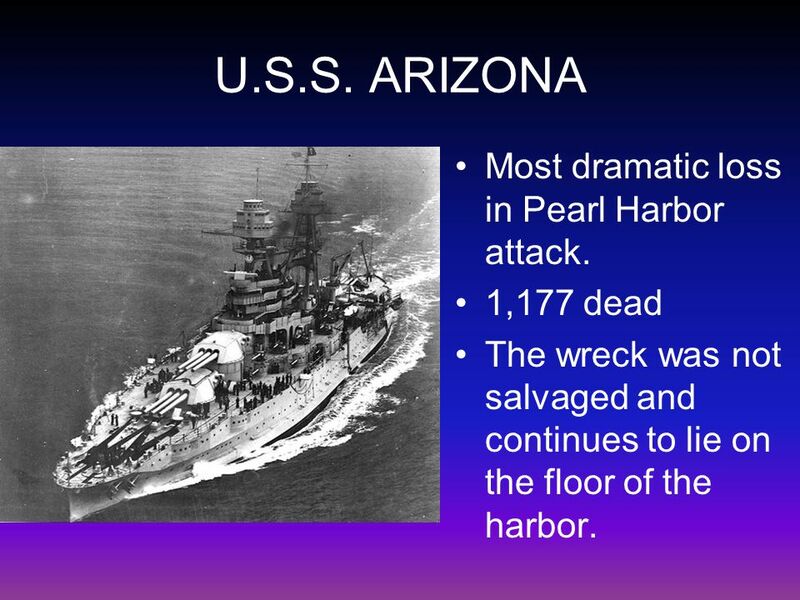 ARIZONA Most dramatic loss in Pearl Harbor attack. 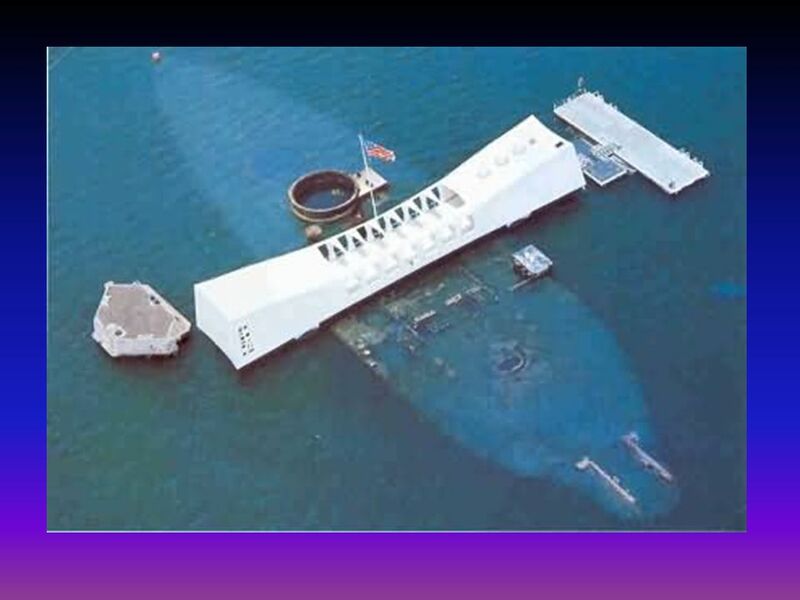 1,177 dead The wreck was not salvaged and continues to lie on the floor of the harbor. 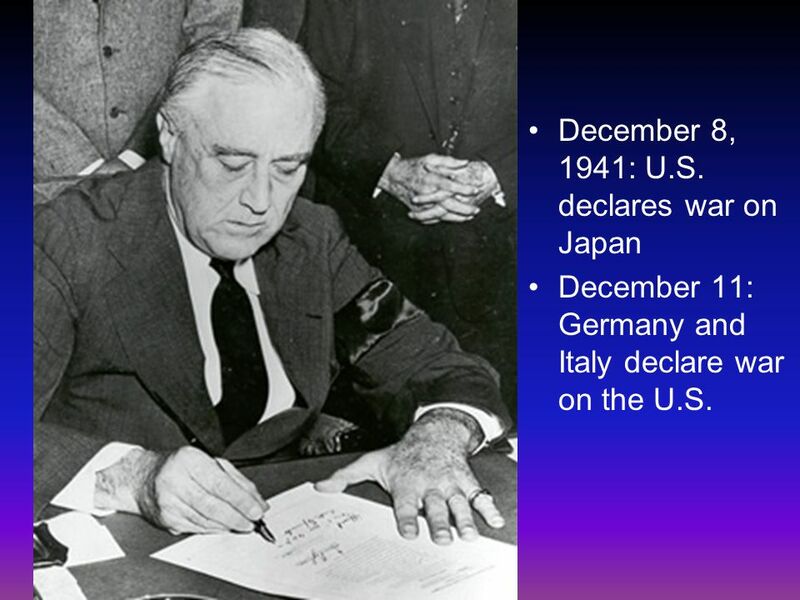 23 December 8, 1941: U.S. declares war on Japan December 11: Germany and Italy declare war on the U.S.
25 CLOSURE In your notes, create a flow chart of events showing increasing tension between the U.S. and Japan. 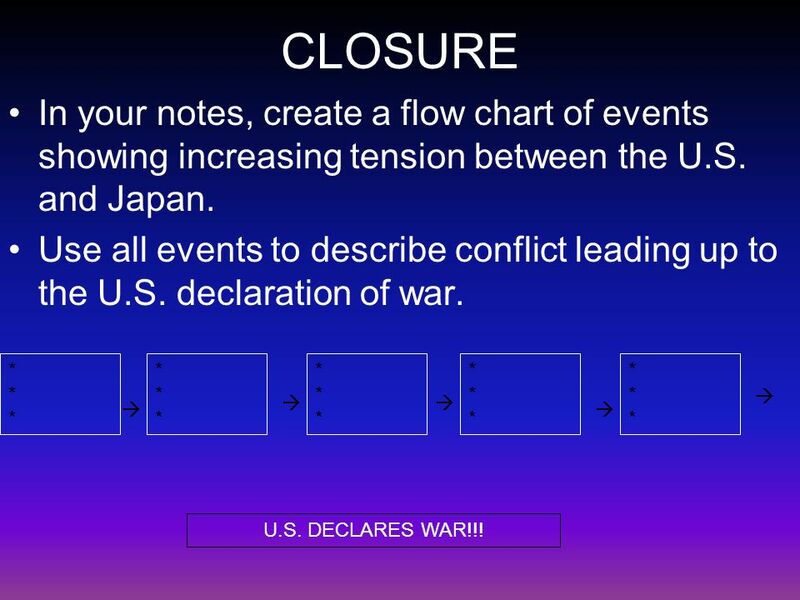 Use all events to describe conflict leading up to the U.S. declaration of war. ****** ****** ****** ****** ****** U.S. DECLARES WAR!!! 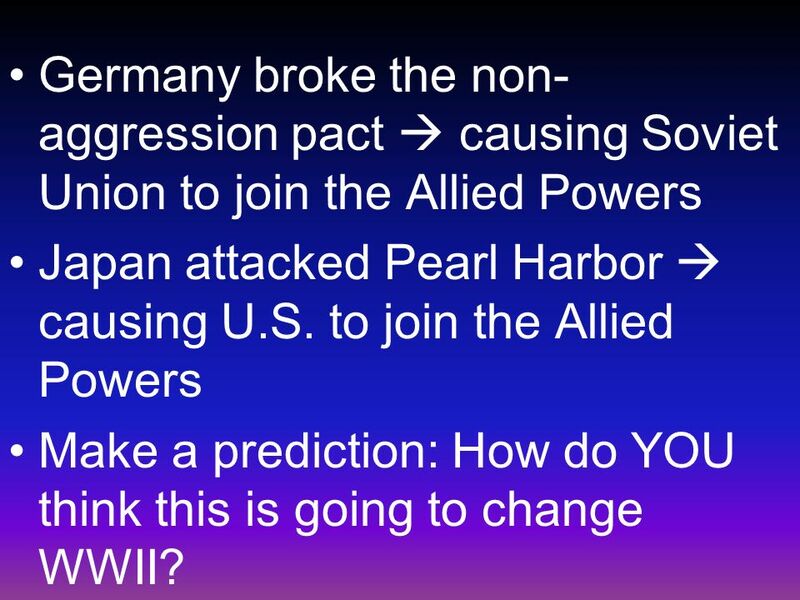 26 Germany broke the non- aggression pact causing Soviet Union to join the Allied Powers Japan attacked Pearl Harbor causing U.S. to join the Allied Powers Make a prediction: How do YOU think this is going to change WWII? 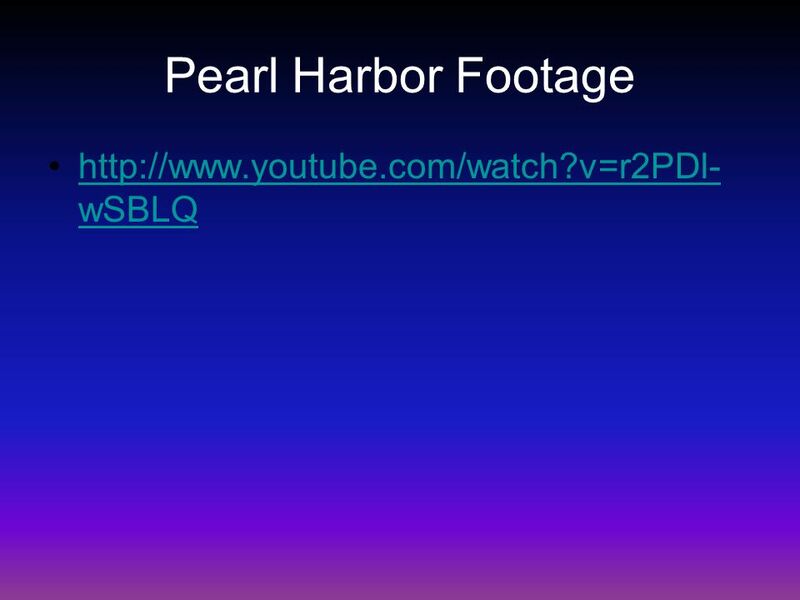 Download ppt "BELLWORK Why did Japan leave the League of Nations? Describe how/why the Japanese military expanded in China. How did the U.S. respond? What was the goal." WWII Review PeoplePoliciesGovernment Misc. Battles. Warm up 1. Which evidence showed that the prosperity of the 1920’s was an illusion? A. A.Prices on consumer goods decreased B. B.Overseas investments. 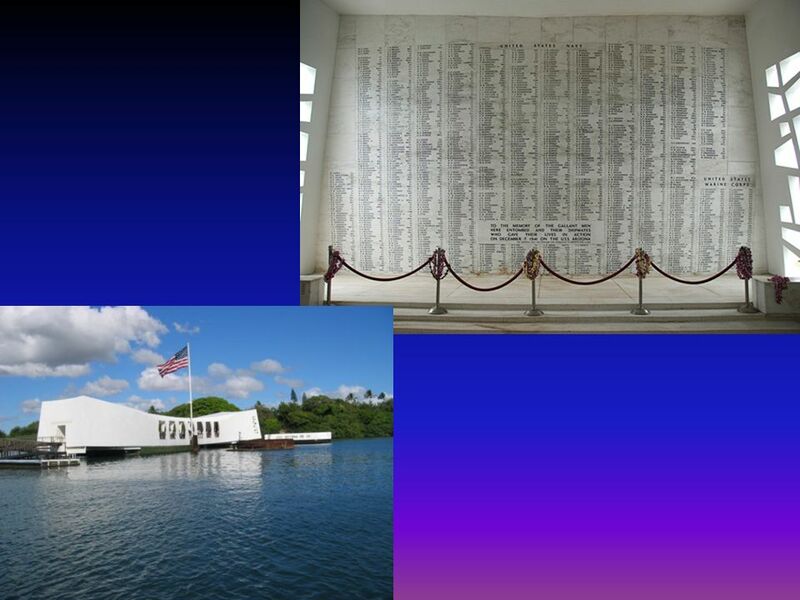 Pearl Harbor Raid 7 December The 7 December 1941 Japanese attack on Pearl Harbor was one of the most defining moments in American history. Europe Erupts in War Lesson 23-2 The Main Idea Far from being satisfied by the actions of France and Great Britain, Germany turned to force and triggered. 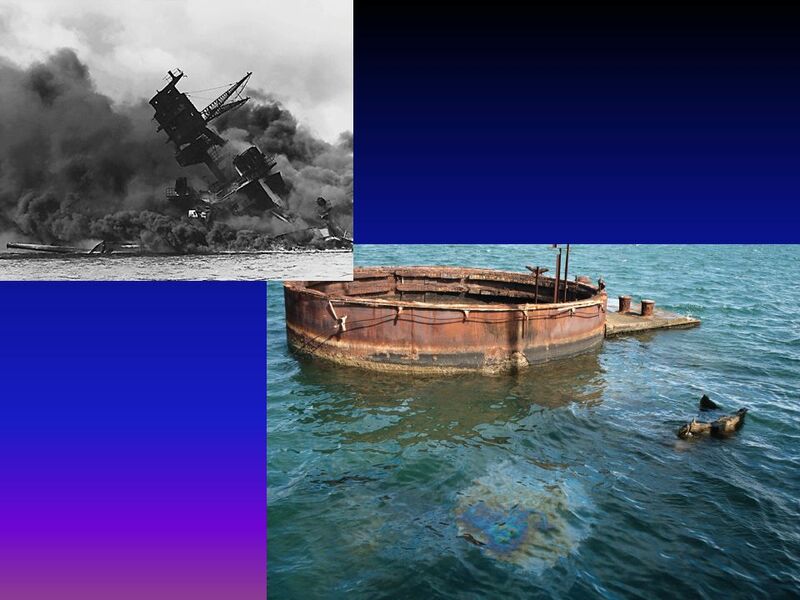 What were the primary causes of World War II?. 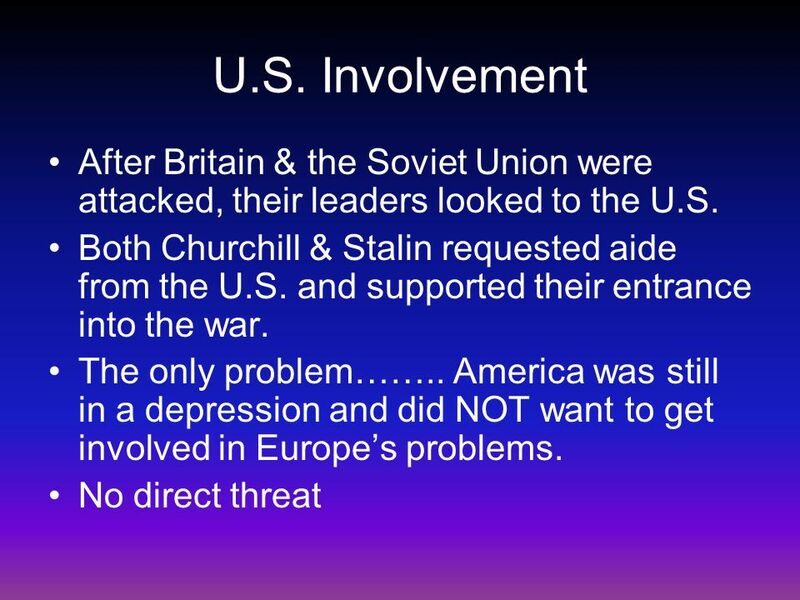 U.S. Involvement in WWII. The Lend-Lease Act By 1940, Britain runs out of funds for war machine Franklin Delano Roosevelt designs a plan to help Britain. Bell Quiz: (page 552) Read the “Point/Counterpoint” box 1) What did isolationists believe about America’s role in the world? 2) What was the interventionist. 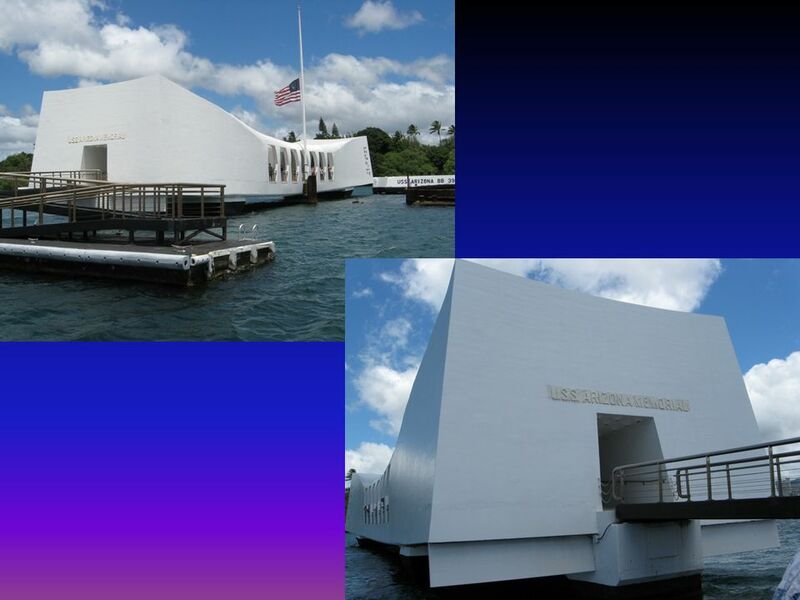 Pearl Harbor Raid 7 December 1941. 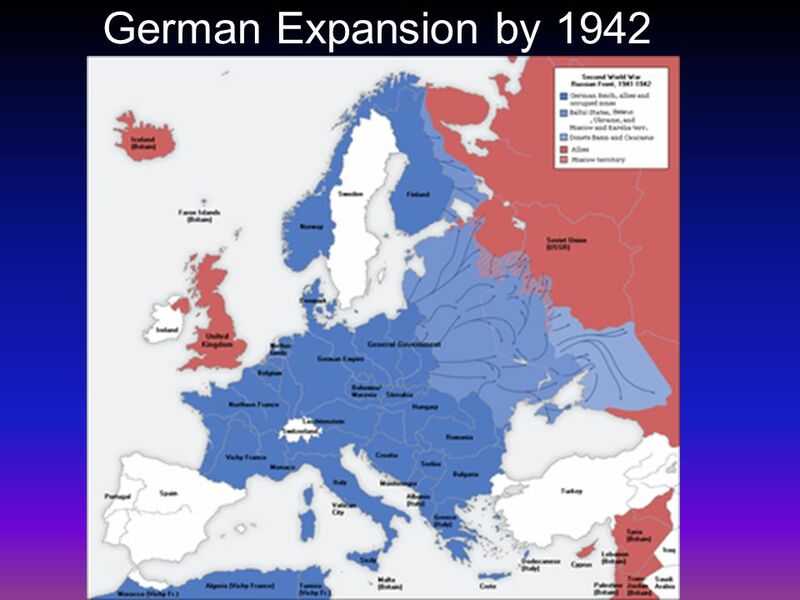 Disputes With Japan ► Beginning in 1940, Japan was allied with Germany & Italy as one of the Axis powers ► By 1940.